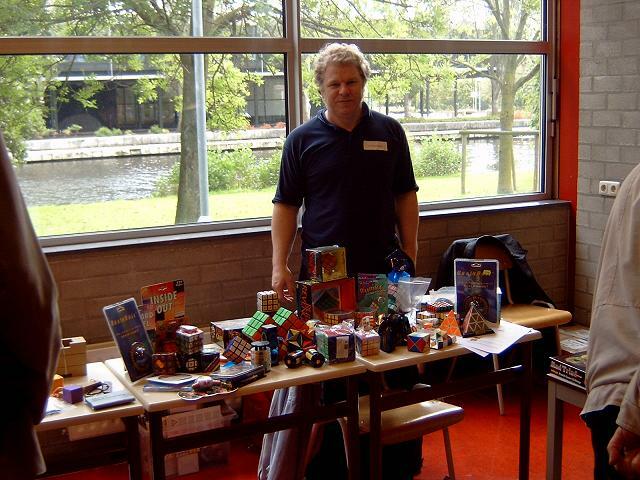 The 22nd Dutch Cube Day was held in Leiden, The Netherlands on Sunday October 6, 2002. More than 100 people gathered in the Leidse Instrumentmakersschool. There was a cube market with about 25 people showing, trading and selling puzzles. There were two lectures: one by Nanco Bordewijk regarding the puzzles of the International Puzzle Party in Antwerp, one by Frans de Vreugd regarding the puzzles of Romania and Hungary and his failed quest to meet Mr. Rubik. This year there was a big (re)union of (speed)cubists: a.o. Jessica Fridrich, Mirek Goljan, Dan Gosbee, Ton Dennenbroek, Oliver Hayden, Lars Vandenbergh, Peter Jansen, Jaap Scherphuis and Ron van Bruchem. This led to the reintroduction of the cube contest at the end of the event which Jessica won in 22 seconds. Second was Lars Vandenbergh in 23 seconds. Olly Hayden, who was dead nervous, finished third, and Tony Fisher (the famous puzzle designer) finished fourth. Ron didn't even dare to compete whilst Dan wasn't able to compete because his wrists were still sore because of his 24 hour cube marathon earlier that week. It was great to see Dan Gosbee coming over from Canada to meet us all. Jessica and Mirek were in Holland for a conference which happily coincided with the Cube Day. Ton Dennenbroek (picture above) who is clearly a mad collector harvested a huge collection, see the picture below. Find out more about the Dutch Cube Day including the big cube cake in Ton's Puzzle Building Corner. Ton and Dan made a large number of pictures. Check them out here.